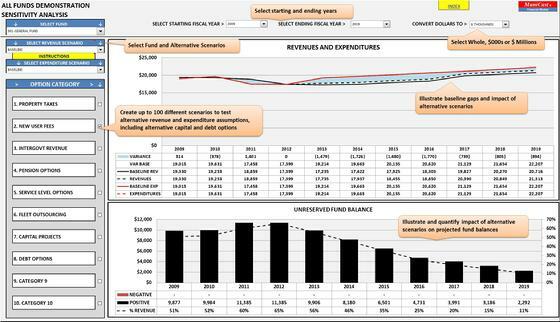 MuniCast financial models provide local governments with the means to create interactive multi-year financial forecasts, historic trend and statistical analysis, and monthly budget vs. actual variance analysis. Both the annual forecasting and monthly variance analysis models are 100% Excel-based and can be custom adapted to meet any organization’s financial planning, analysis and reporting requirements. MuniCast financial models have been implemented at more than 160 local governments throughout the US and Canada, including cities, counties, school districts, water and sewer utilities, transportation agencies, parks and recreation, and other special districts. Click on the PDF icon to see an overview and screenshots of the MuniCast annual forecasting and monthly variance analysis models!